In the global race to create more efficient and long-lasting batteries, some are betting on nanotechnology—the use of minuscule parts—as the most likely to yield a breakthrough. Improving batteries' performance is key to the development and success of many much-hyped technologies, from solar and wind energy to electric cars. They need to hold more energy, last longer, be cheaper and safer. Research into how to achieve that has followed several avenues, from using different materials than the existing lithium-ion batteries to changing the internal structure of batteries using nanoparticles—parts so small they are invisible to the naked eye. Nanotechnology can increase the size and surface of batteries electrodes, the rods inside the batteries that absorb the energy. It does so by effectively making the electrodes sponge-like, so that they can absorb more energy during charging and ultimately increasing the energy storage capacity. Prague-based company HE3DA has developed such a technology by using the nanotechnology to move from the current flat electrodes to make them three dimensional. With prototypes undergoing successful testing, it hopes to have the battery on the market at the end of this year. "In the future, this will be the mainstream," said Jan Prochazka, the president. He said it would be targeted at high-intensity industries like automobiles and the energy sector, rather than mobile phones, because that is where it can make the biggest difference through its use of his bigger electrodes. 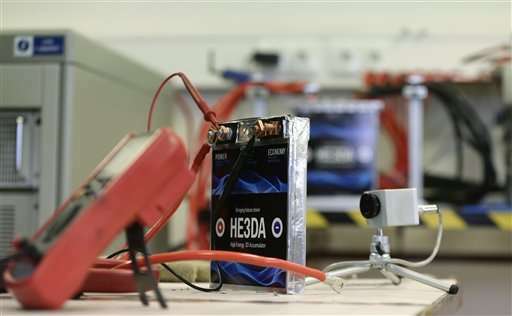 In combination with an internal cooling system the batteries, which are being tested now, should be safe from overheating or exploding, a major concern with existing technologies. Researchers at the University of Michigan and MIT have likewise focused on nanotechnology to improve the existing lithium-ion technology. Others have sought to use different materials. One of the most promising is lithium oxygen, which theoretically could store five to 10 times the energy of a lithium ion battery, but there have been a number of technical problems that made it inefficient. Batteries based on sodium-ion, aluminium-air and aluminium-graphite are also being explored. There's even research on a battery powered by urine. Tesla Motors has been building a $5 billion "gigafactory" to produce lithium-ion batteries for use in its electric cars and potentially to store electricity for homes. It is not using any new technologies, however, just producing very large battery units and marketing them for new purposes. More efficient batteries are crucial if cars are to increase their driving range, which is currently limited compared with what fossil fuels can provide. In renewable energy, powerful batteries are needed to store the energy created by solar panels or wind farms, which gets dispersed when it is sent for long distances. George Crabtree, a Distinguished Fellow at the Argonne National Laboratory in the United States and director of the Joint Center for Energy Storage Research, called the nanotechnology model "a very interesting battery." "There's no doubt that increasing the size of the electrodes that is making them 3D instead of 2D would be a big step forward. That is actually a very right target for advancing lithium ion batteries," he said. "The energy is stored in the electrode, so if you can make the electrodes bigger, say 10 times bigger, then you can have 10 times the amount of energy stored on one charge." Prochazka's battery company is among a group of Czech nanotechnology companies that are gaining international interest. 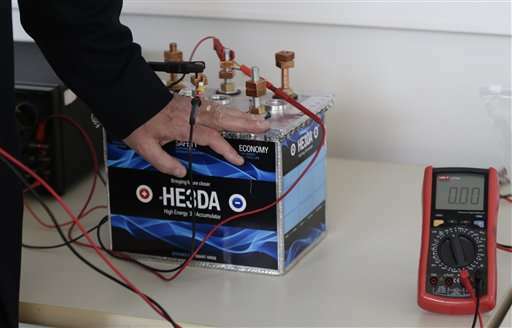 A production facility of HE3DA will be financed by a Chinese investor with an initial investment of almost 1.5 billion koruna ($62 million) that is forecast to double.